Heterodox Academy is the tip of the spear in the fight against what’s wrong with Western Culture. 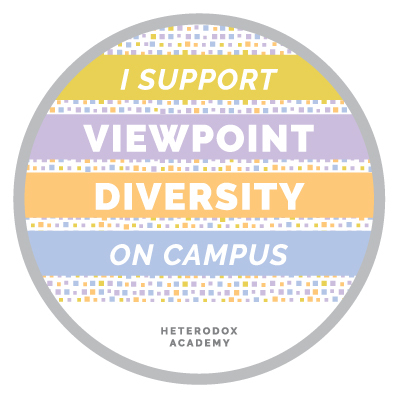 The world is a better place with Heterodox Academy in it. That said, I think it’s possible to be 100% right about the symptoms of a disease yet still fail to diagnose and treat the virus that caused it. I think that’s the case here. I’m not saying Heterodox Academy is wrong. On the contrary, I’m saying they’re right to condemn the watch list. What am saying is that Heterodox should also treat the disease that led to the watch list. We call on everyone who is concerned about the state of higher education to stop devising ways that members of an academic community can report or punish each other for classroom speech. Whether the reporting is done to a campus authority, setting in motion weeks of time-draining bureaucratic procedure that is often far removed from common sense, or whether the reporting is done to the Internet at large, triggering public shaming campaigns and a cascade of threatening tweets and emails, such reporting systems encourage everyone to walk on eggshells. This kind of fearful climate deprives everyone of the vigorous debate and disagreement that is essential for learning and scholarship. Rather than seeking to discourage certain voices on campus, we think the better approach is to encourage a variety of voices—heterodox voices—so that bad arguments can be answered with good ones and scholarly ideas can be tested by the strongest minds on both sides. I can’t help seeing parallels between Heterodox’s statement and Rodney King’s “Can we all get along?” or John Lennon’s “Imagine.” They’re nice ideas with which disagreement is next to impossible in a “wouldn’t it be great if” sort of way, but which seem disconnected from the way human nature actually works; like expecting a course in ethics to elicit ethical behavior. Morality isn’t defined until page 313 of The Righteous Mind because readers aren’t ready to hear it until then. The information in the previous 312 pages is necessary in order for the reader to fully grasp the definition. Bloggers like me and online commenters to statements like Heterodox’s don’t have that luxury. We’re forced to skip all the preliminaries and cut to the chase, which can make us seem like angry polemicists and/or blasphemers against conventional wisdom. Accepting this, I forge ahead. Galileo and David Sloan Wilson were once thought to be blasphemers too, but in the final analysis it turned out that they were right; heliocentrism and group selection are true. I’m not placing myself on par with them. All I’m suggesting is that sometimes a story must be heard many times and carefully tested before its message finally sinks in. Practically every comment I make centers around a single message that I feel stands up to the tests but has yet to sink in. The virus is the toxic mix of the idealism of the Platonic cognitive style and the one-foundation moral matrix. This mix is the first of two conflicting cognitive operating systems, or Apps, of human social cognition. Its chief symptom is the WEIRD, cognitively distorted thinking described in The Coddling of the American Mind that places its complete faith in Oakeshott’s technical knowledge and the power of human reason, and eschews Oakeshott’s practical knowledge, and from which follow phenomena like trigger warnings, safe spaces, the movement against cultural appropriation, and generally the grand narrative of anti-Trump protestors which sees Republicans and conservatives as bad people. They’re not. The vaccine is the mix of Aristotelian empiricism and ALL the moral foundations; the second of the two Apps. It places its faith in both of Oakeshott’s knowledge types and looks more skeptically at the power of reason, preferring instead to adopt a stance of epistemological humility where experience is the surest guide. The syringe with which the vaccine can and should be delivered is the education system. I AM NOT TAKING SIDES FOR OR AGAINST CONSERVATISM OR LIBERALISM! There will always be, in one form or another, a left and a right. I have no interest in changing that, or in converting people into conservatives. I am only saying that 1) the biggest reason for partisan rancor is a profound lack of understanding, on BOTH SIDES of the political aisle, OF the human animal BY the human animal, 2) the Telos of the education system is, rightly understood, to impart that understanding, and 3) the education system has failed in fulfilling its Telos. Viewpoint diversity alone is not enough. The Telos of Truth must ALSO be actively, aggressively, pursued. Questionable orthodoxies (for example here and here) must be called out and repaired or replaced. If we were to do that then it would be impossible NOT to end up with increased empathy, tolerance, inclusiveness, and true understanding than that which currently exists.